The presentation of pseudotumor varies, ranging from asymptomatic cases accidentally observed during routine follow-up, to a patient with well-fixed implants having pain, to severe osteolysis with implant failure requiring complex revision arthroplasty. 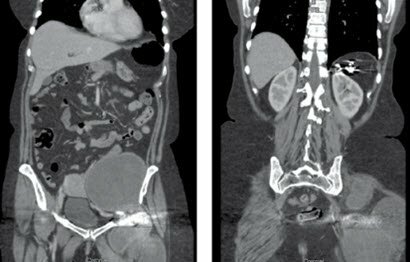 We report a case of a massive pseudotumor that arose in a revision THA with a ceramic-polyethylene bearing. Based on intraoperative observation and review of histologic tissue, we propose a mechanism of pseudotumor formation in this case. 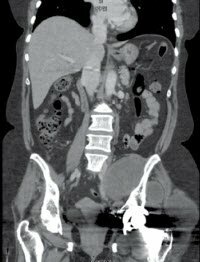 This case involves a 59-year-old female suffering from avascular necrosis of the hips. She has idiopathic thrombocytopenia and has no other risk factors for avascular necrosis. She had a spleenectomy at age 27. For the right hip, she had a core decompression at age 30. Her right hip condition remains stable with only mild intermittent pain. The left hip was treated with primary THA at age 30 (May 1984). Her reconstruction provided a good functional lifestyle, allowing her to enjoy life as a mother. At 15 years postop, she began having pain and a limp. She underwent revision THA in June 2000 (16 years postop) for osteolysis and mechanical loosening of her implants. On the acetabular side, the patient was revised with a porous plasma spray modular titanium cup (Vision™, Biomet, Warsaw, Indiana) with 3 screws. The acetabular liner was a compression-molded polyethylene cup (Himont 1900 UHMWPE) with a 10-degree posterior hood placed inferiorly and posteriorly. Her stem was revised with a titanium alloy modular revision stem (Modular Reach™, Biomet, Warsaw, Indiana). The head was a 28-mm zirconia ceramic bearing (CeramTec, Plochingen, Germany). Postoperatively, she recovered with no problems and again enjoyed an active lifestyle as a mother of 3 children. She suffered one late dislocation in 2007, which was treated with a closed reduction in the emergency room. She had no subsequent dislocations. At 9 years postop from her revision THA, the patient noted no pain or problems with her hip on annual review. The patient was then seen at 10.5 years postop. She reported mechanical low back pain and mild left hip pain. At the time, she started a weight-loss program with daily exercise and had lost 30 pounds. Eccentric polyethylene wear was noted radiographically. Her hip exam showed no hip irritability. She was started on a lumbar trunk stabilization program and her hip was observed. The patient returned at 12 years postop and was symptomatic in her left hip. She reported hip clicking with flexion and had activity-related pain and mild hip “fullness.” Her hip range testing was comfortable with passive range, but her mid-thigh circumference at that time was 2 cm greater on the left. Radiographs showed increased eccentric polyethylene wear. At that time, modular bearing exchange and debridement surgery of the hip was recommended. No other radiographic studies were ordered. The patient declined surgery to finish her teaching duties at an elementary school for the upcoming year. At 13 years postop, the patient returned with increased pain and swelling (Figures 1a-1b). She had developed numbness and tingling in her left leg. An MRI of the lumbosacral and upper pelvis was done to evaluate for sciatica. Two tumors were seen on this study, which prompted further studies by her local physician. Figures 1a-b. Preoperative radiographs of revision left THA. These were taken 13 years after the patient’s revision total hip arthroplasty. Figure 1a (left) shows an AP radiograph. Note the significant swelling medial to the hip and superior to the greater trochanter. There is also osteolytic bone loss of the medial femoral neck region. Figure 1b (right) shows a lateral radiograph. This image demonstrates the significant periarticular soft tissue swelling and peritrochanteric bone loss. These included MRIs of the pelvis and thigh and a CT scan of the pelvis and chest. Loculated masses were identified within the pelvis, hip, and thigh; all appeared to emanate from the hip region (Figures 2a-2c). In addition, one mass was seen extending to the anterolateral distal thigh. Her hip exam revealed only mild irritability. Her mid-thigh circumference was now 6 cm greater on the left. Figures 2a-c. The preoperative coronal CT scan demonstrates the extent of the pseudotumor emanating from the left total hip arthoroplasty. Figure 2a (left) shows the coronal CT cut posterior to the left hip joint. Notice the large pseudotumor extending within the gluteus maximus back towards the iliac crest. Figure 2b (center) shows the coronal CT cut at the level of the left hip joint. Note the extent of the pseudotumors within the pelvis, under the gluteus medius, and the lateral region of the gluteus maximus. The coronal CT cut anterior to the left hip joint is shown in Figure 2c (right). Note the enormity of the pseudotumor within the pelvis. Also note the anterior pseudotumor, which tracked along the medial femur. 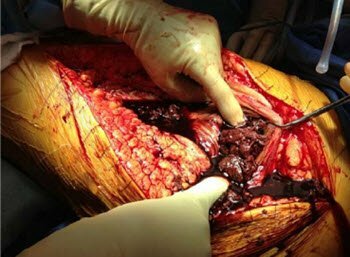 A hip aspiration was performed, drawing off 175 cc of thick, dark fluid with a dark brown and maroon coloring. There was a normal string sign. All cultures – aerobic, anaerobic, fungal, and mycobacterium – were negative. Fluid analysis showed a red cell count of 840,000 and a white blood cell count of 1,000 with 58% neutrophils, 32% lymphocytes, and 10% monocytes. Serum C-reactive protein was mildly elevated at 1.6 mg/dL (normal <0.3) and erythrocyte sedimentation rate was 32 mm/hr (normal 0-15). Her CBC was normal. Serum blood was drawn for a metal lymphocyte T-cell proliferation test (LTT) which was sent to orthopaedic analysis [10,11,19,39] Results showed moderate sensitivity to nickel metal particles (Figure 3). Figure 3. Graphic display of lymphocyte T-cell proliferation test (LTT) for metal sensitivity. 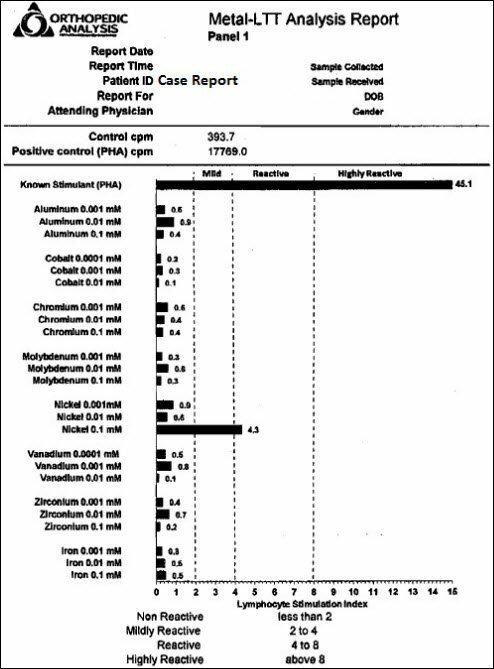 This patient showed moderate reactivity to nickel particles at 0.1mM concentration. Intraoperative examination showed a large multiloculated mass that was extending in multiple directions surrounding the hip region. A large 8×14 cm mass was lateral to the greater trochanter and extended superiorly within the gluteus maximus. On entering the mass, the fluid exited under considerable pressure, shooting out approximately 20 cm in distance. The fluid was bloody with a coloration of dark brown and maroon (Figure 4). Figure 4. Intraoperative photograph of left hip pseudotumor on opening the iliotibial band and splitting the gluteus maximus muscle. The patient is in the lateral decubitus position, with her head to the right of the photo. Note the bloody fibrinous material within the cyst. The hip implants were still well affixed to bone with porous coating (Figure 5). Severe osteolytic bone loss was noted in the proximal femur down to the metadiaphyseal region. The cup showed several osteolytic holes. Figure 5. Intraoperative photograph of the left total hip arthroplasty in-vivo after excision of the posterior and lateral pseudotumors. Significant osteolytic bone loss is seen around the acetabulum and the proximal femoral stem. Also note the metal smear on the zirconia ceramic head located inferiorly. This was caused by the patient’s single hip dislocation 6 years prior. Despite significant osteolysis, both implants were solidly fixed to bone. One pseudotumor mass extended along the iliopsoas into the pelvis for a distance of 12 cm (Figures 6a-6b). Another mass extended along the femur and under the vastus lateralis to the distal one-third of the thigh. The third mass extended in between the lateral ilium and gluteus medius up to the iliac crest. The lateral peritrochanteric mass extended posteriorly over the gluteus maximus. The fifth large mass extended down the medial adductor for a distance of 7 cm. Figures 6a-6b. Intraoperative photographs showing delivery of the pelvic pseudotumor into the hip. Photographs show the femur reflected anterior to the acetabulum. Views are of the left hip in the lateral decubitus position. In Figure 6a (left), an aortic cross-clamp is seen curving into the pelvis along the iliopsoas. The clamp is grasping the inner wall of the intra-pelvic pseudotumor, pulling it inferiorly. In Figure 6b (right), with assistance from a long rongeur and the aortic cross-clamp assist, the intra-pelvic pseudotumor is dissected off the iliopsoas with Metzenbaum scissors and delivered into the hip region. The pseudotumors were excised and a modular bearing exchange was performed (Figure 7). The femoral taper showed no corrosion or adverse wear (Figure 8). A highly cross-linked, vitamin E-infused polyethylene cup (Biomet, Inc., Warsaw, IN) was used. The head was changed over to a 36 mm Delta ceramic head with an internal titanium sleeve (CeramTec, Plochingen, Germany). Figure 7. 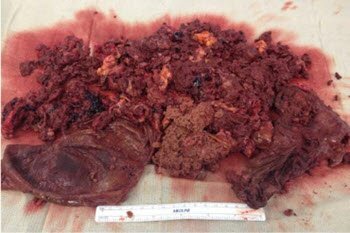 Gross specimen recovery of all pseudotumors from the left pelvis, hip, and thigh. A ruler placed inferiorly is 15 cm in length. Figure 8. Intraoperative photograph of the modular taper junction of the femoral stem. The ceramic head did not have an internal metal jacket. The taper junction shows no abnormal abrasion and is free of corrosion. At 1 year postop the patient still has a mild gluteus medius lurch, but remains pain free. 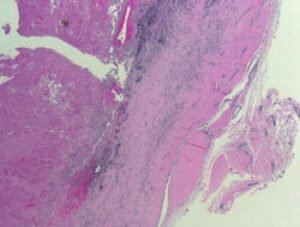 The histologic examination of the pseudotumor was obtained near the base of the intragluteal pseudotumor, just superior to the acetabulum. It was a representative sample of all five pseudotumor masses resected. The histologic images are presented in figures 9a-9b. Figures 9a-9b. Photomicrographs of histologic specimens of the pseudotumor. Specimens were preserved in formalin and processed with Hematoxylin and Eosin (H&E). Figure 9a (left) is a 4x magnification of the pseudotumor, showing that the wall itself measures 1.5 to 3 mm. Within the cyst are decaying red blood cells along with fibrin clots (left side). Note the collagen matrix and fibroblasts that form the pseudotumor sac. The inner lining consists predominantly of monocytic histiocytes. No lymphocytic response is seen within the pseudotumor or in the perivascular regions. Figure 9b (right) is a 40x magnification of the pseudotumor wall near its inner surface. Note specifically the ultrafine light grey/bluish colored particles within the histiocytes. The particles do not refract, indicating that the particles are not polyethylene debris. Instead, these ultrafine particles are likely a titanium alloy particulate shed from the proximal porous coating of the femur. This case of pseudotumor formation is unique. 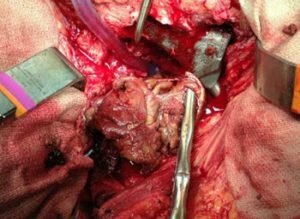 The senior author (EJM) has an extensive history of treating metal-on-metal bearing-associated pseudotumors, and this case was by far the most extensive pseudotumor he has treated. 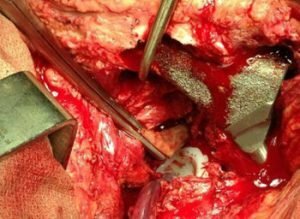 In all, five large pseudotumor masses were excised in a 5-hour-long operation. The bearing in this case was a small-diameter head (28 mm) made of zirconia ceramic. The eccentric wear was visually evident, but could not be described as excessive. In addition, we carefully examined the head-taper junction and did not visually observe any taper corrosion reaction nor any adverse metal wear. We feel in this case that the osteolysis produced from polyethylene wear exposed the proximal porous coating and, via a process of mechanical abrasion with the surrounding soft tissues, liberated ultrafine titanium particles. 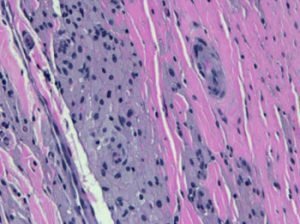 Histologically, the histiocytes in the pseudotumor contained ultrafine metal particles. Since no other metal was used in the case, we must conclude that the metal debris derived from the titanium implants. Most surgeons currently believe the metal debris causing pseudotumors derives from cobalt-chrome alloy bearings. [14,15,16,18,19] This is based on the wear debris phenomenon seen with metal-on-metal bearings over the last decade. [20,22,24,27,28] The toxic reactive synovitis seen with this bearing can cause effusion, pain, and, in some cases, pseudotumor formation when the bearing couple is improperly designed or mated. Figure 10. 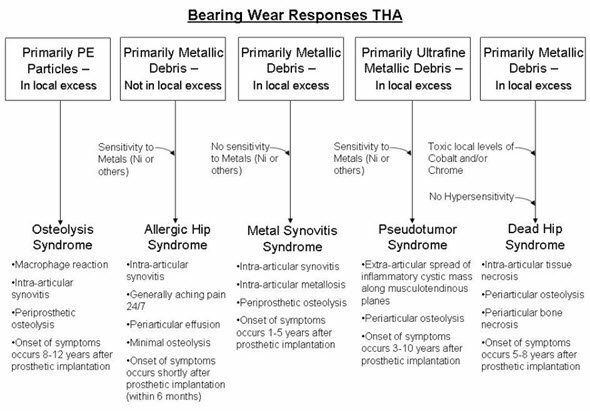 Diagram describing the proposed five major biologic wear responses in total hip arthroplasty. In retrospect, to mitigate the recurrence of the pseudotumor, we advocate sealing off the exposed porous coating to minimize metal particle generation. We feel this would be best accomplished by covering the exposed porous coating with methyl methacrylate cement. In the future, based on the findings in this case, we intend to cover all exposed porous surfaces or, if possible, to replace modular porous segments with segments which have smooth surfaces (preferably polished). Edward J. McPherson, MD, FACS; Matthew V. Dipane, BA; and Sherif M. Sherif, MD, are from the LA Orthopaedic Institute, Los Angeles, California. McPherson EJ, Dipane MV, Sherif SM. Massive Pseudotumor in a 28mm Ceramic-Polyethylene Revision THA: A Case Report. Reconstructive Review;4(1):11-17. Copyright 2014, Joint Implant Surgery & Research Foundation. All rights reserved. Used with permission. Bourghli A, Fabre T, Tramond P, et al. Total hip replacement pseudotumoral osteolysis. Orthopaedics & Traumatology: Surgery&Research. 2010; 96: 319-22. Caicedo MS, Pennekamp PH, Hallab NJ, et al. Soluble ions more than particulate cobalt-alloy implant debris induce monocyte costimulatory molecule expression and release of proinflammatory cytokines critical to metal-induced lymphocyte reactivity. J Biomed Mater Res A. 2010; 93(4): 1312-21. Campbell P, Ebramzadeh E, Nelson S, et al. Histological features of pseudotumor-like tissues from metal-on-metal hips. Clin Orthop Relat Res. 2010; 468(9):2321-7. Clyburn TA. Pseudotumor in metal-on-polyethylene total hip arthroplasty. Reconstructive Review. 2013; 3(1): 18-22.
Cooper HJ, Ranawat AS, Potter HG, et al. Early reactive synovitis and osteolysis after total hip arthroplasty. Clin Orthop Rel Res. 2010; 468(12): 3278-85. Daniel J, Holland J, Quigley L, et al. Pseudotumor associated with total hip arthroplasty. J Bone Joint Surg Am. 2012; 94-A(1): 86-93. Glyn-Jones S, Pandit H, Kwon YM, et al. Risk factors for inflammatory pseudotumor formation following hip resurfacing. J Bone Joint Surg Br. 2009; 91(12):1566-74. Griffiths HJ, Burke J, Bonfiglio TA. Granulomatous pseudotumor in total joint replacement. Skeletal Radiol. 1987; 16(2): 146-52. Hallab NJ, Anderson S, Stafford T, et al. Lymphocyte response in patients with total hip arthroplasty. J Orthop Res. 2005; 23(2): 384-91. Hallab NJ, Caicedo M, Finnegan A. Th I type lymphocyte reactivity to metals in patients with total hip arthroplasty. Journal of Orthopaedic Surgery and Research. 2008;3:6. Hallab NJ, Mikecz K, Jacobs JJ. A triple assay technique for the evaluation of metal-induced, delayed type hypersensitivity response in patients with or receiving total joint arthroplasty. Journal of Biomedical Materials Research. 2000;53(5): 480-9. Hallab NJ. 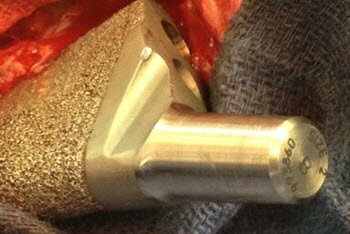 Metal sensitivity in patients with orthopaedic implants. Journal of Clinical Rheumatology. 2001; 7(4): 215-8. Hsu AR, Gross CE, Levine BR. Pseudotumor from modular neck corrosion after ceramic-on-polyethylene total hip arthroplasty. Am J Orthop. 2012; 41(9): 422-6. Hsu AR, Kim JD, Fabi D, et al. Adverse Reactions in Metal-on-Metal hip arthroplasty: two cases presenting as pseudoseptic acetabular component loosening. Am J Orthop. 2011; 40(10): 509-13. Issack PS. Formation of a large rice body-containing cyst following total hip arthroplasty. BMC Research Notes. 2012; 5: 294. Jacobs JJ, Hallab NJ. Loosening and osteolysis associated with metal-on-metal bearing: a local effect of metal hypersensitivity? J Bone Joint Surg Am. 2006; 88: 1171-2. Kang PD, Pei FX, Shen B, et al. Extra-articular inflammatory pseudotumor after well-fixed metal-polyethylene total hip arthroplasty. Chinese Journal of Orthopaedics. 2012; 32(6): 526-32. Kwon YM, Glyn-Jones S, Simpson DJ, et al. Analysis of wear of retrieved metal-on-metal hip resurfacing implants revised due to pseudotumours. J Bone Joint Surg Br. 2010; 92(3): 356-61. Langton DJ, Joyce TJ, Jameson SS, et al. 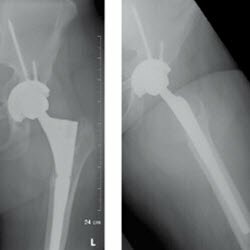 Adverse reaction to metal debris following hip resurfacing: the influence of component type, orientation and volumetric wear. J Bone Joint Surg Br. 2011; 93(2): 164-71. Leigh W, O’Grady P, Lawson EM, et al. Pelvic Pseudotumor: an unusual presentation of an extra-articular granuloma in a well-fixed total hip arthroplasty. J Arthroplasty. 2008; 23(6): 934-8. Mahendra G, Pandit H, Kliskey K, et al. Necrotic and inflammatory changes in metal-on-metal resurfacing hip arthroplasties. Acta Orthop. 2009; 80(6): 653-9. Mao X, Tay GH, Godbolt DB, et al. Pseudotumor in a well fixed metal-on-polyethylene uncemented hip arthroplasty. J Arthroplasty. 2012; 27(3): 493.e13-e17. Matthies AK, Skinner JA, Osmani H, et al. Pseudotumors are common in well-positioned low-wearing metal-on-metal hips. Clin Orthop Relat Res. 2011; 470(7): 1895-906. Mavrogenis AF, Nomikos GN, Sakellarious VI, et al. 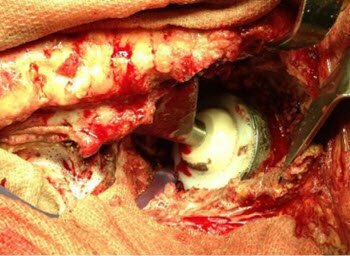 Wear debris pseudotumor following total knee arthroplasty: a case report. Journal of Medical Case Reports. 2009; 3: 9304. Olsen RV, Munk PL, Lee MJ, et al. Metal artifact reduction sequence: early clinical applications. Radiographics. 2000; 20: 699-712. Pandit H, Glyn-Jones S, McLarky-Smith P, et al. Pseudotumors associated with metal-on-metal hip resurfacings. J Bone Joint Surg Br. 2008; 90-B(7): 847-51. Park YS, Lim SJ, Kim JH, et al. Thigh mass associated with polyethylene wear-induced osteolysis after cementless total hip arthroplasty. Arch Orthop Trauma Surg. 2010; 130(9): 1097-101. Polyzois I, Nikolopoulos D, Michos I, et al. Local and systemic toxicity of nanoscale debris particles in total hip arthroplasty. J Appl Toxicol. 2012; 32(4): 255-69. Potter HG, Nestor BJ, Sofka CM. Magnetic resonance imaging after total hip arthroplasty: evaluation of periprosthetic soft tissue. J Bone Joint Surg Am. 2004; 86: 1947-54. Scully WF, Teeny SM. Pseudotumor associated with metal-on-polyethylene total hip arthroplasty. Orthopedics. 2013; 36(5): e666-70. Singh C, Kaplan A, Pambuccian SE. Necrotic granulomatous pseudotumor following metal-on-metal hip arthroplasty: A potential mimic of sarcoma on fine needle aspiration cytology. Diagnostic Cytopathology. 2012; 40(S2): E104-E108. Sugimoto H, Hirose I, Miyaoka E. Low field strength MR imaging of failed hip arthroplasty: association of femoral periprosthetic signal intensity with radiographic, surgical, and pathologic findings. Radiology. 2003; 229: 718-23. Sunderman FW Jr, Hopfer SM, Swift T, et al. Cobalt, chromium, and nickel concentrations in body fluids of patients with porous-coated knee or hip prostheses. JOrthop Res. 1989; 7(3): 307-15. Svensson O, Mathiesen EB, Reinholt FP, et al. Formation of a fulminant soft-tissue pseudotumor after uncemented hip arthroplasty. A case report. J Bone Joint Surg Am. 1988; 70(8): 1238-42. Walsh AJ, Nikolaou VS, Antoniou J. Inflammatory Pseudotumor Complicating Metal-On-Highly Cross-Linked Polyethylene Total Hip Arthroplasty. J Arthoplasty. 2012; 27(2): 324e5-e8. Waters TS, Cardona DM, Menon KS, et al. Aseptic lymphocyte-dominated vasculitis-associated lesion, a clinicopathologic review of an underrecognized cause of prosthetic failure. Am J Clin Pathol. 2010; 134: 886-93. Williams DH, Greidanus NV, Masri BA, et al. Prevalence of pseudotumor in asymptomatic patients after metal-on-metal hip arthroplasty. J Bone Joint Surg Am. 2011; 93(23): 2164-71. Yadav J, Samelko L, Hallab NJ, et al. Osteoclasts lose innate inflammatory reactivity to metal and polymer implant debris compared to monocyte/macrophages. The Open Orthopaedic Journal. 2013; 7: 605-13. Previous articleFemoral Revisions: What Are the Options? Next articleDoes Pathologic Evaluation of Tissue after Knee Arthroscopy Have Clinical Value?